I love getting together with people, and sharing my love of Stampin’ Up! and their wonderful products! The look on a new stampers face when they first see the magic of the Big Shot and an embossing folder, or hearing the exclamations of ‘oh wow’, ‘oh I love this one’ as they turn each page of the catalogue never gets old, you know? Last night was one of those nights, as the wonderful Ms. Colleen hosted another party 🙂 I got to see some wonderful familiar faces, and meet some new people as well. Thank so much for being a wonderful hostess, Colleen! I’m sure everyone had a great time, and are looking forward to receiving their goodies next week! I just had to share the fun of some of the new stamp sets & tools from the new Holiday catalogue – would you like to see the cards we made? Okay – here they are! 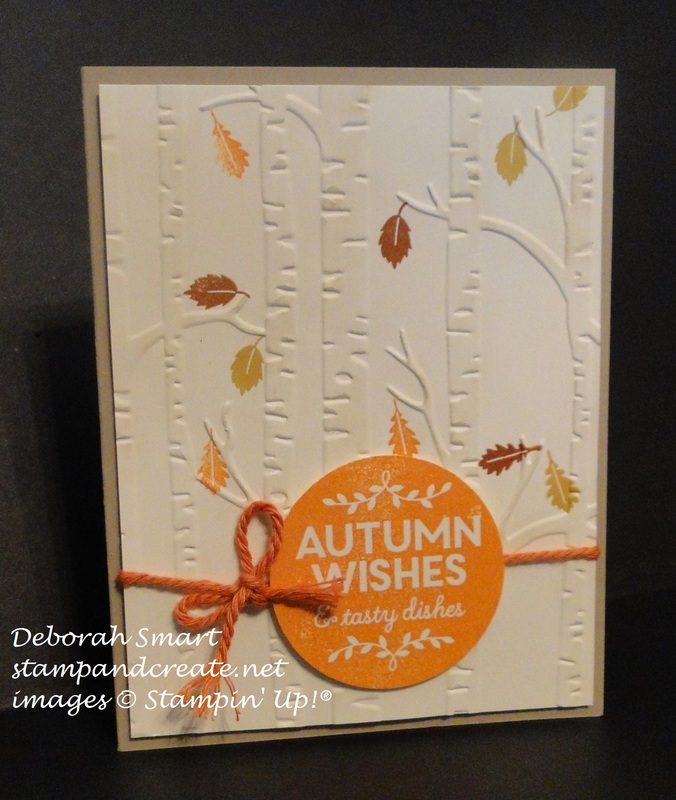 This first card combines 2 of my favourites – the Woodland embossing folder and the Among the Branches stamp set. We started by embossing the 4″ x 5 1/4″ Very Vanilla cardstock with the Woodland embossing folder and the Big Shot (that’s the magic!). We then used a Sponge Dauber and Crumb Cake ink to add some colour to the birch branches. Then, using the leaf stamps from the Among the Branches stamp set, we added some leaves in Delightful Dijon, Pumpkin Pie and Cajun Craze inks. Using the same stamp set, we then stamped the sentiment in Pumpkin Pie ink onto a 2 1/2″ x 2 1/2″ piece of Very Vanilla cardstock, then used the 2″ Circle Punch to punch it out. After wrapping some retired Tangelo Twist Thick Baker’s Twine around the embossed panel, the sentiment was attached using Stampin’ Dimensionals, then the whole panel was attached to the card base of Crumb Cake cardstock. This card is an excellent example of how a simple card can be ‘stepped up’ just by using an embossing folder, and sponging on some colour. Our next card is cute; I created it with a nod to Colleen’s cat Mei-Mei (or is it May-May? I’m not sure) who always feels put out when we gather to stamp, as she feels she is not getting the attention of which she is worthy! 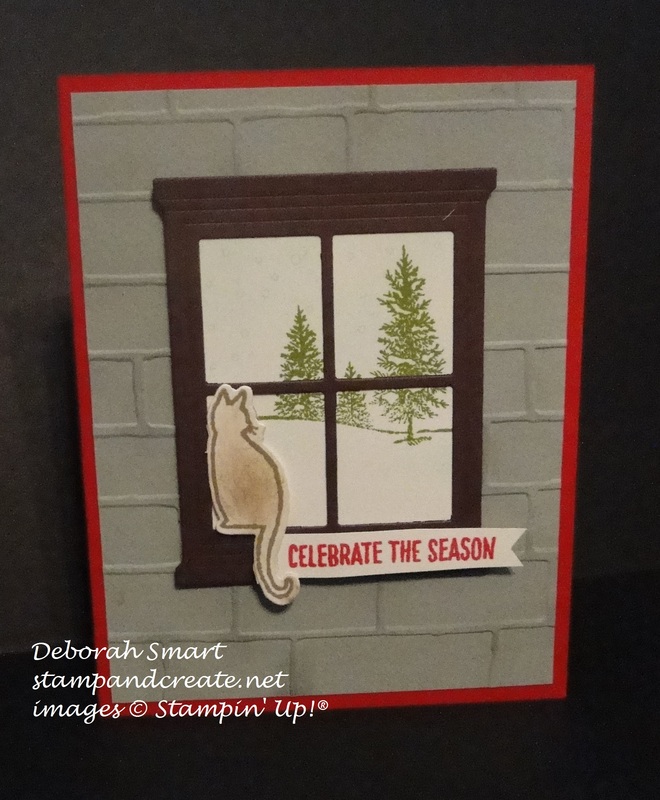 This card incorporates so many of my favourites – the Brick Wall embossing folder, the Festive Fireplace stamp set (for the cat), the Hearth & Home Thinlits Dies (window frame) and the Happy Scenes stamp set (the view). The scene is stamped onto Whisper White cardstock using the Old Olive ink pad; then we added the snowflakes (they’re there – just very faint!) in Soft Sky ink. We then layered the window frame, which had been die-cut using the Big Shot and the Hearth & Home Thinlits Dies from Chocolate Chip cardstock, over the stamped panel. The cat was stamped in Crumb Cake ink, then coloured in lightly by using a Sponge Dauber and the Crumb Cake ink pad. We then die cut the cat image using the Festive Fireside Framelits Dies, and popped her onto the window ledge using Stampin’ Dimensionals. The sentiment was stamped from the Happy Scenes stamp set in Real Red ink onto Whisper White cardstock, and die cut using the Bitty Banners Framelits Dies. It was also attached to the window ledge using Stampin’ Dimensionals. We then took a 4″ x 5 1/4″ panel of Smoky Slate cardstock and ran it through the Big Shot using the Brick Wall embossing Folder. Then, using a Sponge Dauber and the Smoky Slate ink pad, we added some colour to the ‘grout’ lines, then attached it to the card base of Real Red cardstock using a Glue Stick. The window image was then added to the centre, using Stampin’ Dimensionals. I think that by combining the Festive Fireplace images and Framelits with the Happy Scenes stamp set and Hearth & Home Thinlits Dies, the combinations of scenes are endless and amazing! I can’t wait to play with both of these bundles a lot more! Oh, that’s right – you can purchase these as bundles – one bundle combines the Festive Fireplace stamp set & Festive Fireplace Framelits Dies (#140860), and the other bundle combines the Happy Scenes stamp set and the Hearth & Home Thinlits Dies (#140853) – and you save 15% on each bundle, over the combined retail price! Now that’s a deal worth getting! If you would like to order any of the products we used in making these cards, you can simply click on the image(s) below, and you’ll be taken directly to my online store. Or, you can simply call or email me with your order, and I’ll be happy to place it on your behalf. Oh – and remember, everyone – if you want to receive 12 weeks of holiday ideas, complete with tutorials, make sure to sign up for my newsletter (the pop up sign up when you first come to my blog), as it’s EXCLUSIVE FOR MY NEWSLETTER SUBSCRIBERS ONLY! 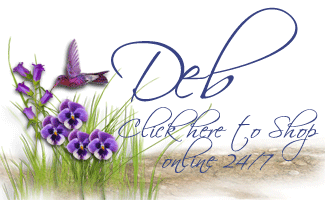 I won’t be sharing the tutorials or pictures here on my blog, Facebook or Pinterest pages – you have to sign up for my newsletter! But hurry – my special 12 Weeks of Christmas starts Sept. 28th – you won’t want to miss a thing!